Last week Gabriel Biderman wrote a post about making printing part of your photographic process. I loved it. Reading it brought me back to my earliest days of photography. As it is for Gabriel, printing was always a huge part of my creative process. An image wasn’t complete until I mounted and framed the finished print and shared it with others. Now, in this post, I’ll go over the modern tools and techniques so that you, too, can feel the satisfaction of a finished print. Lower Manhattan skyline from Brooklyn. Fuji X-T2, 16-55mm f/2.8 at 21mm. 25 seconds, f/6.4, ISO 200. Although you don’t need an overly robust computer to print your images, you do need a good computer monitor. Why? One word: WYSIWYG (What You See Is What You Get). A quality monitor, like the BenQ SW240, is the first step to a quality print. Today’s monitors can easily exceed the brightness and contrast that a print can display, so it’s important for us to be working with a high-quality and calibrated monitor. If you are not working with a high-quality, calibrated monitor, you can never expect your prints to look like what you see on screen. Every choice we make when editing our images depends on what we see on our display. If the monitor is too dark, we’ll adjust our images so they end up being too bright. If the monitor is too contrasty, we’ll force our images to end up being overly flat. It just can’t be overstated how important using a good, calibrated monitor is to the editing process. Here at National Parks at Night, we love our BenQ monitors. They cover 99 percent of the Adobe RGB color space and have the manual controls necessary to perform an accurate calibration. Both of these qualities are necessary for them to be considered high-end photography monitors, but they also go a step further by being calibrated straight out of the box. 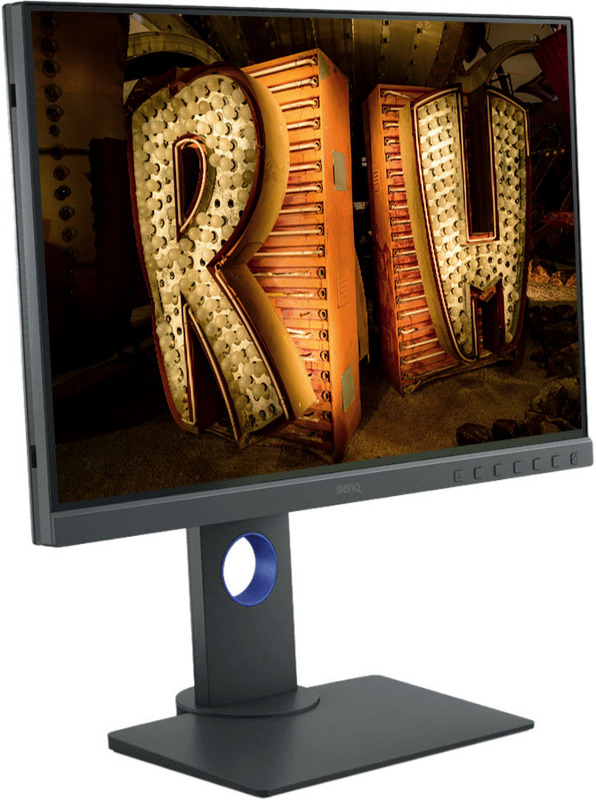 For less than $400 you can get the BenQ SW240 24" Photovue. For just a little more you can upgrade your screen real estate to 27 inches with the SW2700PT. Even the best screens in the world, however, will drift out of calibration. Despite starting off accurate, they drift into being too bright, too dark, off color, or displaying too much or too little contrast. So it is essential that we continue to calibrate our monitors as we use them. Our favorite colorimeter, the X-Rite i1Display Pro. We use this on our monitors at home, and on our workshops too, for calibrating TV displays and projector/screen combos in the meeting rooms. I have my monitors on most of the day and calibrate them about once per month. If you have your screen on constantly, then you might consider calibrating more often. Regardless of how often you keep your monitors lit, you should certainly calibrate them just before you begin a new printing project. There are many excellent calibration solutions out there, but we have settled on the X-Rite i1Display Pro to keep our monitors in line. Whichever system you choose, you’ll get some sort of colorimeter and the software to run it. Once you have a high-quality and calibrated monitor, you can rest assured that you are getting WYSISYG. This means you are ready to make some prints! Now you just have to choose between using a print lab or making prints yourself at home. Both avenues have pros and cons. The Bay Photo Xposer is one of our favorite print formats at the moment, and is a good example of the variety of formats available only from labs. For many good reasons, most photographers choose labs for their prints rather than making them at home. Why? Because there are several advantages that are widely attractive. To begin with, there is no upfront expense. No need to run out and buy a printer, stock up on inks or purchase a small raft of paper. Using a lab is also less frustrating and less time-consuming. This allows the photographer to focus on their work behind the camera rather than spending more time in front of the computer. While there are advantages to printing at home, saving time (and perhaps even money) is not one of them. For those who want a no-hassle printing solution—use a lab. And be sure to choose a good one. If you don’t, you’ll end up spending more time and money than you expected. taking time to choose a pro lab to make your prints is a decision you’ll never regret. Your prints will be on the highest-quality papers, they will always be accurate, you will have a wide variety of formats to choose from, and the process of ordering and receiving will be streamlined. Just be aware that not all labs produce the same quality prints and deliver as high a level of service. While there are many excellent pro labs out there, we use and love Bay Photo for all of the reasons outlined above. The Epson P600 is a good example of a good home printer for great photos. Printing at home can be very rewarding, but it can also be extremely frustrating. Inkjet printers (both high-end professional as well as prosumer models) are notoriously fussy. Their nozzles can clog, the paper can jam and sometimes they are just simply bewildering. But when things are going smoothly, printing at home is pure joy. The biggest advantage is seeing your images immediately. No waiting! If your print comes out a little dark, it’s a snap to reprint it. Too warm? No problem—adjust the white balance and print again. Owning your own printer also allows you to easily and quickly experiment with different types of papers. From high-gloss to satin to watercolor paper, there are a host of surfaces and brand options to choose from. Each type has a slightly different look; you may find that you prefer gloss for some types of photography and watercolor for others. Being able to experiment at home makes finding those preferences much easier. This is the fun part! Ansel Adams famously quipped, “the negative is like the composer's score … [and] the print is the performance.” This means we get to take the original score (our capture) and (re)interpret its performance (through editing). Whether sending your image to the lab or to the inkjet printer in your digital darkroom, this is the step where you can unleash your creativity. From Photoshop to Lightroom to innumerable plug-ins and stand-alone programs, there is no shortage of technology to help you create the best version of your photograph. Once you have created your masterpiece, it’s time to get it ready for printing. We’ll use Lightroom as our example, but most programs will behave in much the same way. If your final destination is the lab, the process of prepping your image is fairly simple. It’s really just a matter of making or exporting a copy of your file and uploading it to your favorite printing service. 1. In the Library module, select your image. 2. Choose File > Export, or click on the Export button at the lower left of the screen. Export Location: Under Export To, choose Desktop. This will send the copy to your desktop so that you can upload it to the lab. File Naming: Here you can choose to rename your photograph. Or not. Totally up to you. File Settings: Choose JPEG for image format, Quality 100 and leave Color Space at its default of sRGB. Image Sizing: Ensure that you uncheck the Resize to Fit box. Output Sharpening: Here you can choose the type of paper you’ll be printing on (Glossy or Matte) and level of sharpening you would like to apply. Begin with Standard until practical experience suggests using Low or High. That’s it! Hit the export button and a copy of your masterpiece will land on your desktop ready for uploading to your favorite lab. Lightroom Export settings for sending an image to a photo lab. Using Lightroom’s Print module is pretty straightforward when you forego the many superfluous options and just get down to making prints. 1. Select your image and then move to the Print module. 2. From the Template Browser on the left, choose Maximum Size. 3. Click the Page Setup button at the lower left of the screen. Choose your printer, paper size, and whether you want a vertical or horizontal orientation. Color Controls: If the print dialog offers the option of Color Matching, choose the printer’s color controls. Print Quality: Manufacturers will have different names describing print quality. Don’t choose Fast, Draft or Economy. Use a setting that produces a high-quality photograph. Borderless: Avoid using this setting. It generally causes more problems than it’s worth. If you want a borderless print, manually trim the paper after printing. Color Options: Some printers will allow you to tweak the look of the image with certain options such as vivid or realistic. Best to play it safe here and stick with the defaults. Experiment as desired. Set Print Resolution to 360 for an Epson printer or to 300 for any other manufacturer. Set Print Sharpening to Standard for the first print. If the result is overly sharp or too soft, choose Low or High on the next printing. Under Color Management, set the Profile to Managed by Printer. Uncheck Print Adjustment for the first print. If you find your print comes back too dark or too light, then you can return to this setting on your next printing. Whether you are crafting your own prints at home or sending out your files to off-site experts, making prints of your photographs is a great way to honor the work you’ve put into your craft. They also make excellent holiday gifts … just sayin’.